Summary: This article shows you how to easily and freely view 3D Blu-ray movies on your smartphone via Google Cardboard by ripping 3D Blu-ray to SBS MP4 videos. Google Cardboard, another excellent virtual reality headset followed with Samsung Gear VR, Zeiss VR One, has gained widespread reputations amongest 3D lovers, not only because of its lower price, but also its powerful compatibility with nearly any smartphones including Android, iPhone 6 and iPhone 6 Plus. If you happen to have a bunch of 3D Blu-ray collections at home, it's a pity for you can not get them on your Andorid/iOS devices through Google Cardboard with 3D Effects. In this article, I'll glad to share some useful tips to help you move your 3D Blu-ray medias into Google Cardboard for viewing freely on your smartphone. As a matter of fact, Google Cardboard lacks ability to play 3D Blu-ray movies but it can play Side-by-Side MP4 videos. That's to say, in order to view 3D Blu-ray movies in Google Cardboard successfully, you're advised to rip and convert 3D Blu-ray to SBS MP4 videos initially, and then you can use the Google Cardboard theater app to play the converted videos in 3D effect. To do this, you can use Brorsoft's 3D Blu-ray to SBS MP4 converter tool. 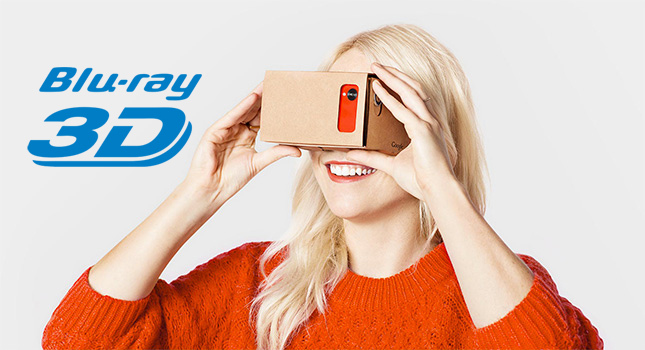 With it, you can convert 3D/2D Blu-ray to Google Cardboard supported side-by-side video files with lossless quality. In addition, it offers other 3D videos as MKV Top-bottom 3D video, MP4 top-bottom 3D video, MKV side-by-side 3D video, which can play on Gear VR, VR One, Oculus Rift DK2, Air VR, etc. perfectly. The equivalent Mac version is Brorsoft 3D Blu-ray Ripper for Mac. Now download the right version on your computer and follow the tips below to finish your task. Install and launch Brorsoft 3D Blu-ray Ripper, and then load your 3D source movies to this program. Google Cardboard can accept 3D SBS MP4 so you can click "Format" bar on the interface then navigate to "3D Video" to choose "MP4 Side-by-Side 3D Video (*.mp4)", "MP4 Anaglyph 3D Video (*.mp4)" or "MP4 Top bottom 3D Video (*.mp4)" as the output format. Tips: Click "Settings" button to do corresponding settings regarding to video, audio like video codec, file size, video bitrate, frame rate, etc. Plus, you can also select 3D Anaglyph like Left/Right mode. Hit the "Convert" button to transfer your 3D Blu-ray to MP4 Side-by-Side 3D video for playback with Google Cardboard. 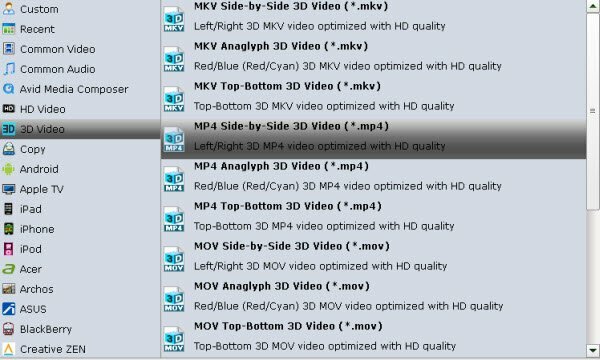 After conversion, you can hit "Open" to find the generated 3D videos. Then, you can transfer the converted video files to Android phones or iPhone and other devices for Google Cardboard enjoyment. This article mainly talks about ripping and transcoding 3D Blu-ray to SBS MOV/MP4, so as to view your 3D Blu-ray movies on iPhone 6/Samsung Galaxy S5 freely via Zeiss VR One.